Home / Knitting blog / It's Thursday. Pander to me. It's Thursday. Pander to me. It must be Thursday... I never could get the hang of Thursdays. I watched Hitchhiker's Guide to the Galaxy again. Although I'm sure there are Douglas Adams purists out there who object to the 2005 movie interpretation of the book, this is a favourite movie of mine. Yes, yes, I'm sure it's a watered down version of the Hitchhiker mythology, but what book-into-movie isn't watered down? My idea of a successful book-into-movie is something that entertains and stays true to the spirit of the original without trying to quote the original. I've seen complaints that the movie is a series of gags. But, while Adams' book is undoubtedly very very clever, it too is full of gags, so that seems a silly complaint. Case in point, in a scene that is reproduced (quite faithfully) in the movie, Arthur and Ford are waiting to be ejected from the Vogon airlock and Arthur says, “So this is it...we are going to die." All debate aside, who doesn't like a movie that brings together Mos Def, Martin Freeman, Bill Nighy, Sam Rockwell, Zooey Deschanel, Alan Rickman, Helen Mirren, Stephen Fry and John Malkovich? Yes, I'm sure, this type of casting is pandering to hipsters and Gen Xers, but who doesn't want to be pandered to? AND, did you know that Marvin (the paranoid android), while voiced by Alan Rickman, is acted by Warwick Davis? Aka, Willow? How's that for pandering? 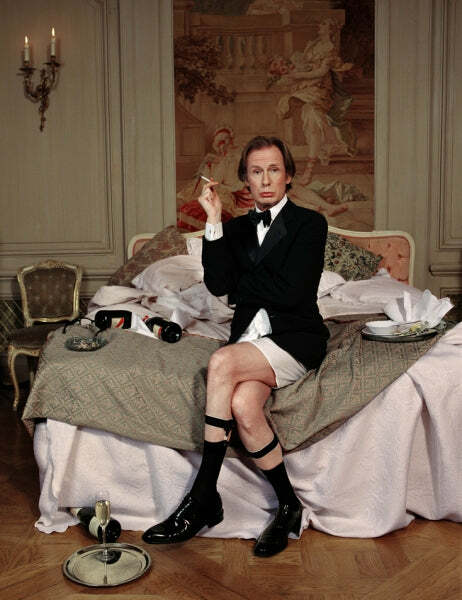 And in parting, a little Bill Nighy for you. I don't usually scoop images that I didn't take myself, but this one is already all over Pinterest and is perfect for Thursday.